You see the outfit you like on the mannequin or on the rack at your favorite fashion boutique… love it and buy it, but when you get home, it just doesn’t look the same on you as it did in the store… umm! Did you ever think it might just be your body shape, and, that you just need a little help on which fashions suits your body shape better? It’s easy to learn and once you do learn the tricks, you’ll know, what better suits your shape, choose wiser when shopping and look fabulous in your clothes, all year long. Read below and consider the body shapes described, to determine which one best describes you, then read the tips for that body shape for what to wear and not to wear, so you can look your best all year long. Rectangle/Ruler/Straight: A slim body shape, with thin neck, shoulders, hips, wrists, calves, and ankles. It’s pretty much the shape of a ruler. Think Gwyneth Paltrow, Thandie Newton and Cameron Diaz. wear this: frills, ruffles and bows on tops, skinny jeans with detail on hip area, if you like, flowing linen trousers will also look very elegant, A-line skirts and tulip hemline skirts, bias cut dresses or shift dresses with shape and sharp tailored jacket or flared coats that stop at the hip. not this: Cropped or baggy tops, tunics or anything that doesn’t give you a waist, combat or cargo style pants, very full or big puffy skirts will put you out of proportion and be aware of those maxi skirts if you are too tall, a very straight sheath or anything with a drop waist, dropped waist coat or anything tubular without a belt. Apple: This body shape is what you might call curvaceous, where women generally have, for the most part, narrow hips and a large chest and stomach areas. 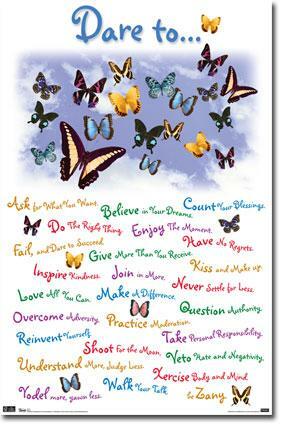 Think Queen Latifah, Oprah Winfrey, Jennifer Coolidge and Star Jones. wear this: low or V-neck tops, tunics, embellished sleeve details, flat fronted pants, boot-cut or flared jeans, knee-length, calf length or bias cut skirts, empire line, bias cut, wrapped style and somewhat lower neckline dresses, fitted jacket that buttons below the bust or a tailored classic long coat or light trench style coat. not this: bulky knits, round neck T-shirt, tapered trousers or skinny jeans, avoid pleats, flounces, ruffles, short or tight, fitted skirts, shapeless straight shift dresses, waistline detail such as belts and bows, clingy, jersey and flouncy fabrics, boxy jackets that finish at the waist and puffy jackets. 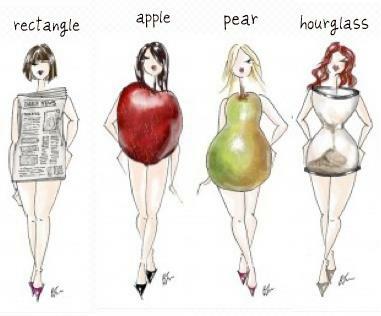 Pear: Women with this body shape tend to have mid-thickness waists and ankles, small to medium size shoulders and chests, and wider hips. Think Jennifer Lopez, Elizabeth Hurley and Kim Kardashian. wear this: color above the waist, striking necklines, puffy sleeves, basic leg-flat front trousers, flared-leg trousers, clean lines and muted colors below the waist, go for volume – either structured or full and flowing-A line skirts, A-line dresses, somewhat lower cut neckline, embellished bodice with lots of detail, wide lapels, structured shoulders, details like faux-fur collars, and voluminous sleeves will balance you out. not this: avoid skinny lapels on shirts, small, dainty collars, plain tops, skinny jeans, cargo pants with pockets on the thigh, tight pencil skirts and tube skirts, fishtail skirts will bring out your hips too much, bias cut skirts, light bright colors and bulky buttons, tight stretchy dresses, sheath and bias cut dresses, tiered flouncy bottoms on dresses, skinny lapels on coats, and slouchy shouldered styles. Hourglass: This is the classic “hourglass” shape, with wide shoulders and hips, and a somewhat narrow waist and have curvy bodies that balance out a bikini top and bottom. Think Jessica Simpson, Beyonce, Scarlett Johannson, and Britney Spears. wear this: low halternecks and square neck tops are stunning, fitted cardigan with the top buttons undone, vertical stripes, wide leg trousers, bootcuts and flared jeans, pencil skirts and A-line skirts, knee length skirts, wrap dresses, scoop, sweetheart and V necklines, strapless dresses, belted coats and trenches, cropped jackets, and fitted button-under-the-bust blazers. not this: baggy t-shirts and jumpers, high necks, bulky detail, straight tunic tops, skinny nor slouchy jeans, side flip pockets, tight stretchy skirts, fishtail skirts, empire line dresses, straight sheaths, frills and bows at bodice area, tight dress styles, slouchy, shapeless styles, baggy jackets, drop-waisted coats and swing coats. Now that you know the basic body shapes and where your body fits, you should now able to see why some styles of clothing look great on, for example, an hourglass figure and won’t necessarily flatter a pear shaped woman or an apple shaped woman. Having your clothes lay perfectly over your body shape shows the quality imprint of the garment so much better. Now that you have so many fashion ideas for your body shape, you can now discover the joy of shopping all over again. If you would like more information about your body type and what it might say to you and others, feel free to take a short quiz from Your Beauty, The Science of a Beautiful You, web site to determine your contours and other specific advice on health, beauty and shopping advice. ← The Inner Path: Balancing You Life!